Orgone pyramid helps to filter and balance energy fields in our environment and can aid in strengthening your energy body by converting low frequency energy into a higher frequency that is more beneficial for life forms including yourself, pets and plants. ✔Our Energy generator Orgonaite- is made on the same technology as Wilhelm Reich’s Orgone Accumulator. 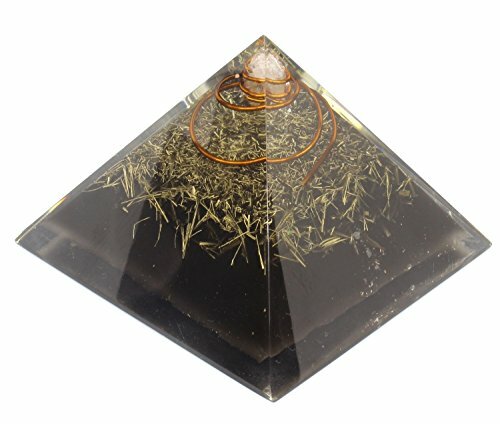 ✔Orgone pyramid helps to neutralize electronic smog (EMF)- from cell phones, cell phone towers, wi-fi, computers and electronic devices that you expose yourself to on a daily basis.The interaction of organic resin and inorganic metal creates orgone. ✔Healing Chakra- condensed metal matrix that include a combination of quartz crystal and other energy clearing crystals and stones that absorb negative energies and transmutes them into positive forces that stimulate the body to heal itself. ✔The crystals and stones- have been charged with positive intentions prior to casting. They have also been smudged with energy clearing white sage. Smudging is an ancient Native American tradition used to cleanse negative energy.The Orgonite are infused with harmonic tones during the curing process that help balance the body's natural frequency. ✔Large amounts of positive energy-. By simply holding or being near these devices you will feel large amounts of positive energy. This is also known as Chi, Prana, and Zero point energy. If you have any questions about this product by Orgonite Crystal, contact us by completing and submitting the form below. If you are looking for a specif part number, please include it with your message.